Changing the way Canadians cook — for good. It was late October of 2015, and we were walking into a meeting with the accomplished founders of the meal-kit delivery service, Culiniste. After a few years spent working in finance and venture capital, Jonathan Ferrari and Neil Cuggy channeled their passion for cooking wholesome, home-cooked meals into a business. After fifteen months of bootstrapping and proving the concept in Quebec and Ontario, they were ready to take on the rest of Canada. Their mission to reinvent their creative and marketing efforts led them to Dynamo; our experience building digital products for Blue Bottle Coffee and OMSignal made us a clear fit. In that initial meeting, we established that one of the early goals was to change the name. ‘Culiniste’ sounded awkward, and wouldn’t translate well in the English-speaking parts of Canada. Moreover, the name didn’t stand for anything — and Jonathan and Neil had both spent a lot of time ensuring that Culiniste not only provided healthy meals at an affordable price, but also that it was able to give back to local communities by offering free breakfasts to students for every box delivered. They wanted a name that easily expressed what it is that they do and the mission that drives them — similar to brands like The Honest Company and Airbnb. To begin, our team kicked off the project by adapting a few Design Sprint exercises to run with Neil and Jonathan. First, we invited everyone in the room to fold their piece of paper four times to yield 8 quadrants. In 8 minutes, we asked people to come up with 8 potential company names — the goal being not to filter and just to get ideas out on paper. After the 8 minutes were up, everyone passed their papers to their left and we spent an additional 8 minutes building on the names that the person jotted down in the previous round. From there, we hung all of these names on the wall and used dot voting to establish some patterns and see what was working (and what wasn’t). With some clear favorites in mind, we headed back to the office to continue working. Our team consisted of two art directors, Max Kaplun and myself, designer Louise Heng, project manager Nick Lepine, copywriter Rebecca West and the co-founder and CEO of Dynamo, Alex Nemeroff. 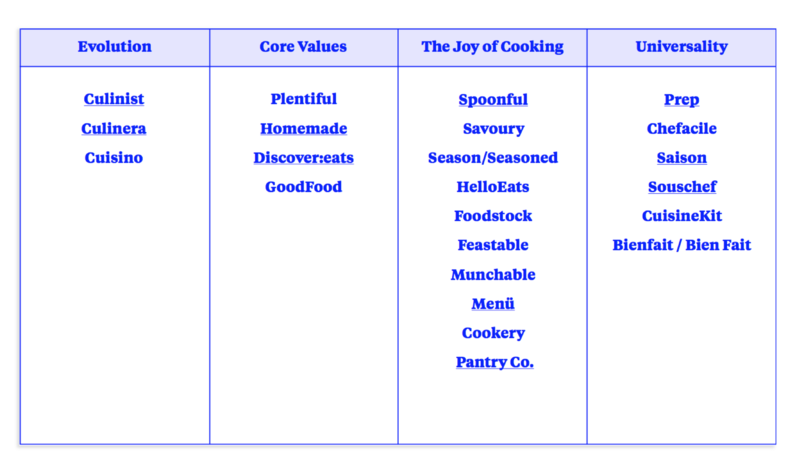 Based on our mini-sprint, discussions, ongoing brainstorming and sometimes frantic Slack messages, four distinct themes emerged from which we chose to explore the renaming process: Evolution, Core Values, The Joy of Cooking and Universality. As you can see, the proposed names offered a diverse sampling — some were an evolution on the current name, while others remixed elements of the company’s values in new and exciting ways. Some of the names picked up on the ease and convenience of the service, while others aimed to be inclusive of the bilingual nature of Canada with a nod to Goodfood’s Montreal heritage. Because names can be subjective, we decided to mock-up some design directions to better indicate where we could take the brand. These are not necessarily logotypes or finalized directions, it’s really just a variety of visual perspectives — almost like a moodboard. We called them style tiles. To make a long story short, Neil and Jonathan were having a hard time envisioning any of these names as the right one. The feedback we got was scattered, because we hadn’t done a great job of setting the tone for the visual directions. In fact, most of the feedback we got was centered around the style tiles, when all we really wanted was constructive criticism about the themes and names presented. For the next round, we decided to eliminate the visuals entirely and outline a few reasons why we chose each name, how it would function in french, a few pros and cons, a competitive analysis and a quick search on available domain names. The good news is that we were onto something. By removing the subjective nature of visuals and the monotony of reviewing lists of names, Jonathan and Neil were able to assess the value of each and every name individually. Progress. It was right before the holidays, and we knew we needed to put together something impactful to give Jonathan and Neil something to consider before their office closed between Christmas and New Years. That way, come January 1 — we could hit the ground running on the visual identity and packaging. At the time, we realized through a lot of internal conversations, heated debates and self-editing that everyone will have given associations with particular names or words. There will never be clear consensus, so we should stop striving for it. Instead, we realized that as long as we had a name that touched on the core values that Jonathan and Neil had outlined initially, it didn’t really so much matter if everyone loved the name (the client included) — but instead that we had the right strategy to back it up. Names are hard — and renaming a successful company after a year in business was already a daunting task. By this point, it was clear that no name was ever going to match up simply because it felt like no one could agree on a name longer than five minutes, let alone a lifetime. In retrospect, this seems benign, but in the midst of working on this for weeks on end, this type of perspective was an enlightening breakthrough in our process. We forged ahead with the shortlisted names, and booked an in-person meeting with Jonathan and Neil to give them our perspective. This time around, we focused less on styles, and chose instead to focus on quick iterations of the logo and website. We cleared away the clutter, and presented four concrete directions that we were proud of. Internally, we agreed that we’d stand behind any of these names, and were excited to design for them, no matter the outcome. We left our opinions at the door, and presented the following names: Goodfood, Parcely, Saison and Maisonmade. 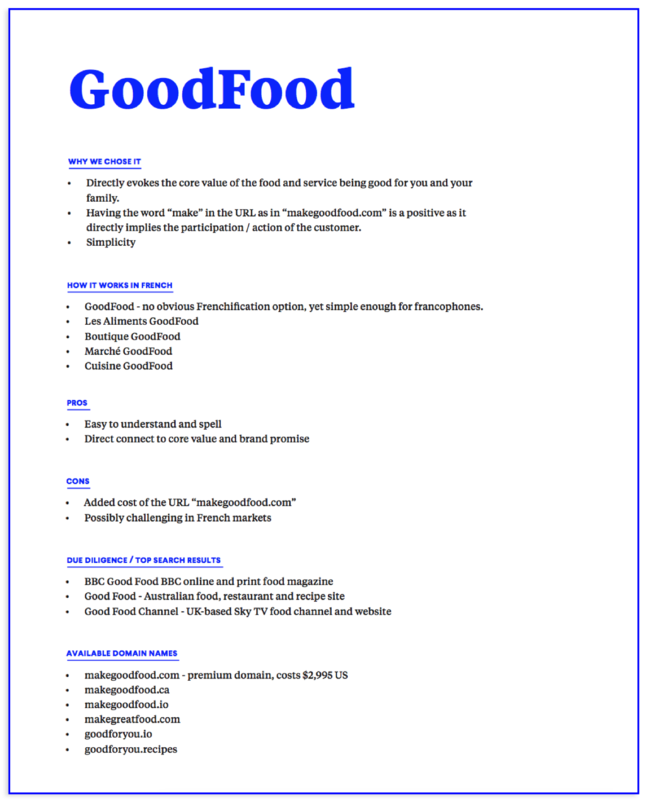 A few weeks later, Jonathan and Neil gave us the go-ahead to proceed with the name Goodfood. Above all else, it communicated their commitment to offering healthy meals at an affordable price point. The name was simple, memorable and iconic. ‘Goodfood’ synthesized complex concepts, and presented them in a clear, straightforward way — much like The Honest Company’s name. The name can be easily understood over the noise of a crowded bar. It’s easy to spell and understand. No companies in their field were using this name or a variant thereof, giving Goodfood the opportunity to truly make their mark in a crowded marketplace. 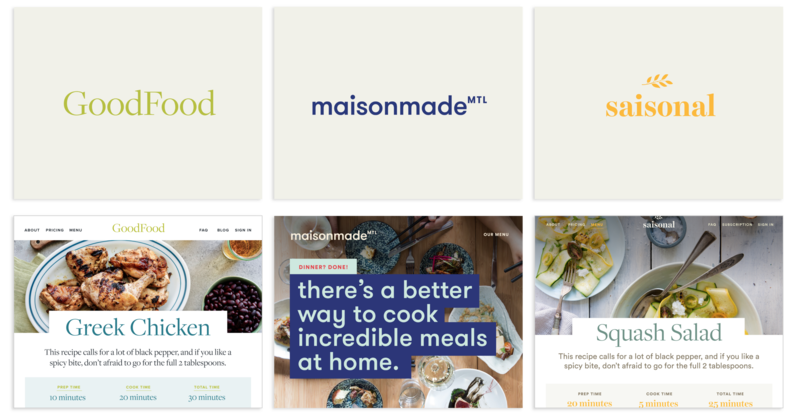 The domain name ‘makegoodfood.ca’ was readily available, and provided a subtle call-to-action for prospective clients and existing users. The words ‘good’ and ‘food’ were common anglicismes used in the French language, and would be easily understood by a francophone audience. With the name secured, it was time to design a visual identity that lived up to it. 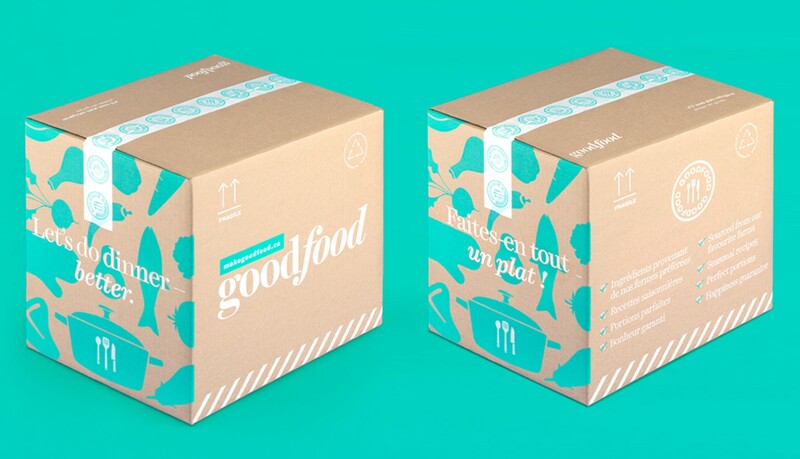 By now, it was January and Goodfood wanted to launch their rebrand in March to coincide with their expansion plans. If you’ve read this far, it goes without saying that creating a brand isn’t just about a new logo. By definition, it’s the sum total of the company’s actions and how that affects people’s perception. In this case, going through a rebrand that affected every aspect of the company — including landing pages, a digital product where people could customize their subscription, weekly emails, marketing collateral, labels and stickers, packaging and associated collateral — meant that we’d not only have to build this for the Goodfood of today, but also left enough flexibility for the team to grow and expand their business, and to continue building on the foundation that we set. Our biggest challenge with this project was designing elements that were not only beautifully branded, but easily templatized for their operations. Each week, the test kitchen writes recipes and sources the ingredients. These ingredients are shipped to the headquarters, where they are stored for a short time and then picked, portioned and individually labeled and placed into the box for shipping. 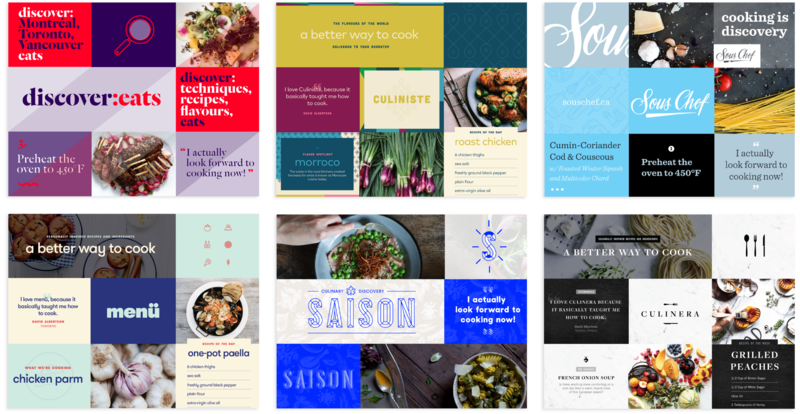 This means most of the collateral — like emails, labels, stickers and recipe cards — have to be refreshed week over week, so it was imperative that our designs were easily translatable for a variety of different recipes and ingredients. The initial Culiniste logo had a more hand-drawn look with a swash. While we appreciated that it reflected a brand that holds its clients interests personally, there wasn’t a lot of visual legacy for us to play with. We wondered if we might be able to incorporate this concept of a signature as part of our logo, and got to work. Because the name was so straightforward, our early explorations leaned heavily in favor of a wordmark as opposed to an icon. An icon or visual of food felt to us a bit redundant. We tried a variety of different typography explorations. After a few iterations, we set the wordmark in Okay Type’s Harriet, and we were sold: there was something that felt all at once traditional, recalling home-cooked meals of decades past, and contemporary, hinting towards the convenience and practicality of the service that’s made possible by the rise of on-demand services in today’s economy. One of our key insights is that we needed a font family that complimented each other, and various aspects of the brand. In their existing collateral, there was no real sense of hierarchy — and visually scanning even something as simple as a recipe card became a burden. Flexibility was key. To ensure that we had some good contrast, body text and supporting type would be set in Schwartzco’s Bau. The coupling was approachable, upbeat and refined — three points we were aiming to hit since our initial meeting with Neil and Jonathan. Used alone, the mark was a bit long — so we decided to riff on the concept of Good Housekeeping’s seal of approval by making our own seal. Something that could be used as a standalone item to reinforce the brand on elements like packing tape, social media avatars and even specific packaging for meat or fish, which we had briefly discussed designing sub-brands for. Picking a palette for a food company is hard work. Red seems urgent and off-putting. Greenwashing is rampant. Blue is taken. Cooking means so many different things to so many different people, we knew we had to define the brand in our own way — while still portraying the convenience of the service and how easy it is to cook these delicious meals in 30 minutes or less. The palette had to be approachable, considered — but most of all, unique. We did weeks of research before settling on a palette, looking inside the industry to see where the majority of colors landed. Many lean on one spot color (Blue Apron, Plated and HelloFresh to name a few), which presents an awesome opportunity for ownership. We knew we wanted to capitalize on this in some way, but were sensitive to the fact that much of the visual impact would rely on delicious, mouthwatering photos of food. We also knew that working with great photography would allow us to bring a variety of colors into the story later, and that we simply had to find a brand color that would be able to hold its own. We landed on a bright teal. The box (and everything that goes inside of it) was one of the largest touchpoints for consumer interaction and could even serve as a sales tool if we approached the design in the right way. In this regard, porch appeal was key. We wanted to generate a sense of excitement when the box arrived at a customer’s doorstep — mimicking the excitement you have when receiving a gift. We knew we wanted a dynamic design that made use of the bold colors, typography and brand messaging in a big, bold way. Because the box also had to be bilingual, it was important for us to use the spatial real estate in a strategic way. In order for us to successfully release the new identity into the world, we had to, of course, update the look of the consumer product. 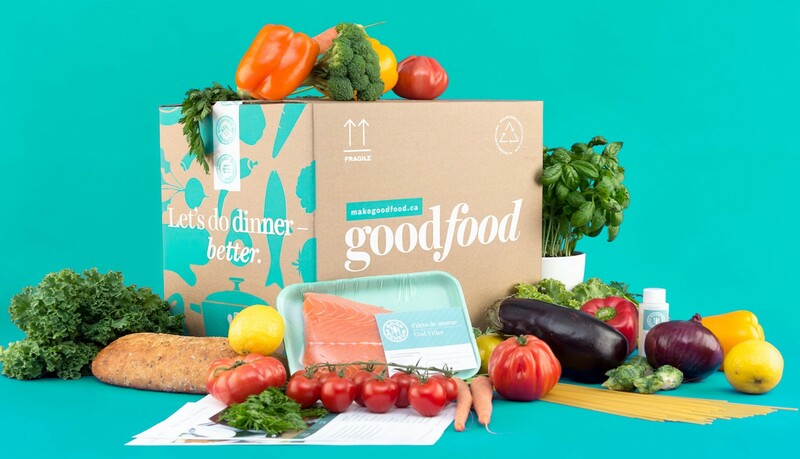 The website is where users come to select their meals for the upcoming week, but we wanted to spend more time thinking through how we could better convert users to subscribe to Goodfood’s meal plans. Use a content-first approach to tell the story. The homepage should do a better job of showcasing Goodfood’s unique offering and their commitment to giving back to the community. State plainly how the service works, and reinforce the convenience aspect with reviews from various demographics, i.e. busy mom, young urban professional, student, etc. Let the food do the talking by introducing more ‘product’ imagery — beautiful images of creative meals. Use a scaffolding approach, so that users can weigh their options without getting bogged down with inputs and selections. When a user makes one selection, only then will the following input appear. Place trust at the forefront by showing the answers to frequently asked questions and reviews from the get-go. Of course, this is just a small sampling of the hundreds of decisions we made as part of the design phase, but it is representative of how customer acquisition played a key role in our design process. With the packaging sent to print and the website set to deploy, the team was ready to change their name – and the way Canadians cook — forever. It was clear that Goodfood needed a name, identity and website that embodied their company values: quality, convenience and community. During the rebrand, we had many discussions with Jonathan and Neil about how the name gave their team something to strive towards. Goodfood gave them a call to arms, and a reason to wake up every morning and do their best to live up to those ideas. When I reflect back on this, it’s easy to see why this project turned out the way that it did: Jonathan and Neil are exceptionally passionate about their food, company and community. They truly considered every decision, how it would help them scale, what it may impact and how they might benefit. At Dynamo, it’s rare that we have a chance to work so closely with co-founders, and have input ranging from big-picture details to the nitty-gritty packing labels, but when we do, the result is always so rewarding. Jonathan and Neil were also incredibly patient with us — following us down the winding road and difficult task of naming a company; a challenge that took us twice the amount of time we thought it would. From this experience, our team learned a great deal, and we now have a battle-tested process in place that we use to name companies in less than a week. To learn more about Goodfood, check out the case study on our website. There are a few people who worked tirelessly to bring this brand (and case study) to life; they are Max, Louise, Beckii, Rebecca, Simon, Nick and Alex. Thank you!